paul gregutt's washington wine blog – unfined & unfiltered: let’s all agree not to diss a gris! The first thought that went through my mind was “what about Sancerre?” – pure Sauvignon Blanc, rarely priced under $20. Perhaps just the exception that proves the rule. I don’t disagree that this is a problem, but I truly believe that it is not insurmountable. And there are many good ideas floating around about how to make it so. This coming weekend, Jo Diaz will be posting up some of them here. For now, I simply want to urge consumers to explore the best of these wines. They generally show far more complexity and flavor interest than comparably-priced ($12 - $16) domestic Chardonnays. Yet they are not so far removed from that style that it will require a leap of faith to enjoy them if Chardonnay is currently your go-to white wine. The Symposium always wraps up with a tasting of dozens of current releases. This year I counted around 35 different wines, from some two dozen wineries, mostly from the 2012 vintage. I’ve listed below some of my favorite producers. I am confident you will find their Pinot Gris to be world class wines. Spicy and intense, this excellent Pinot Gris from Pacific Rim (now Vinmotion) is loaded with green apple, cut pear, and a taste of orange peel. It shows surprising length and power for a Euro-styled wine with modest (12.5%) alcohol. And, what would we do without You? How do I love thee, Paul Gregutt? Let me count the ways. Most quiet need, by sun and candle-light... and with Oregon Pinot Gris. 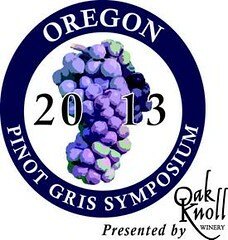 In my old griefs, and with my childhood's faith, whenever it involves Oregon Pinot Gris.